This page summarizes our key findings from various assessments using the Energy Policy Simulator. For more information on an analysis, click on the link provided at the end of each section below. In November 2014, the United States and China made a joint announcement, in which the U.S. committed to reducing greenhouse gas emissions 26-28 percent below 2005 levels by 2025. The U.S. later submitted this target as its Intended Nationally Determined Contribution (INDC) for the UNFCCC’s Conference of Parties (COP21) in Paris in December 2015. 1 “Direct economic costs” refers to direct capital expenditures and operational savings due to the policies modeled in the Policy Solutions package. These values are calculated in inflation-adjusted 2012 dollars, discounted at 3 percent annually from a base year of 2016. 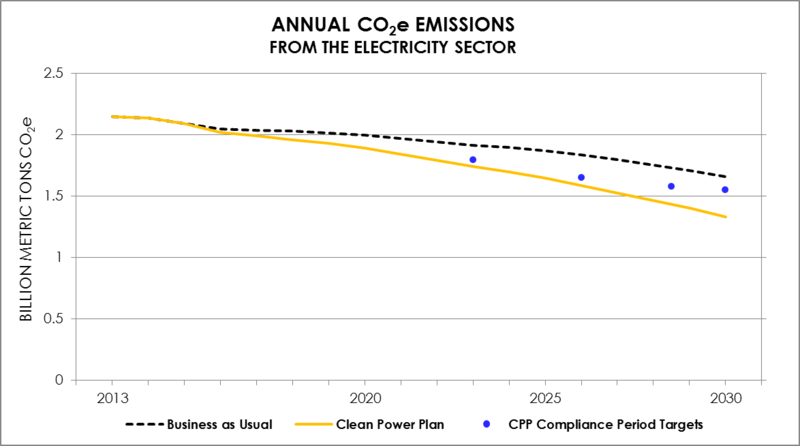 In August 2015, the Environmental Protection Agency released the final Clean Power Plan (CPP), which requires the electricity sector to reduce its carbon dioxide emissions 32 percent from 2005 levels by 2030. Of course, there are many ways to meet the Clean Power Plan, but not all policy packages will be cost-effective. The Energy Policy Simulator allows us find the policies that deliver results at the lowest cost, rather than picking policies due to political or technological preference, which tends to save less money than an objective, optimized package. For example, we analyzed two alternative scenarios. The first, the Nuclear + CCS scenario, retires less coal per year, increases carbon capture and sequestration, and builds additional nuclear energy when compared to the base Clean Power Plan scenario. The second, the Only Renewables scenario, retires more nuclear per year and increases the total share of renewable electricity when compared to the Clean Power Plan scenario. Both of these scenarios, along with our Clean Power Plan scenario, meet the Clean Power Plan target, but at starkly different costs. The Only Renewables scenario saves $9 billion by 2030, while the Nuclear + CCS scenario actually costs $25 billion by 2030. Conversely, the Clean Power Plan scenario has net savings of $41 billion by 2030. 2 This value represents direct capital expenditures and operational savings (using inflation-adjusted 2012 dollars, discounted at 4 percent) due to the policies modeled in the Clean Power Plan package. These values do not include monetized social benefits. It pays to adopt energy and climate policies sooner rather than later. 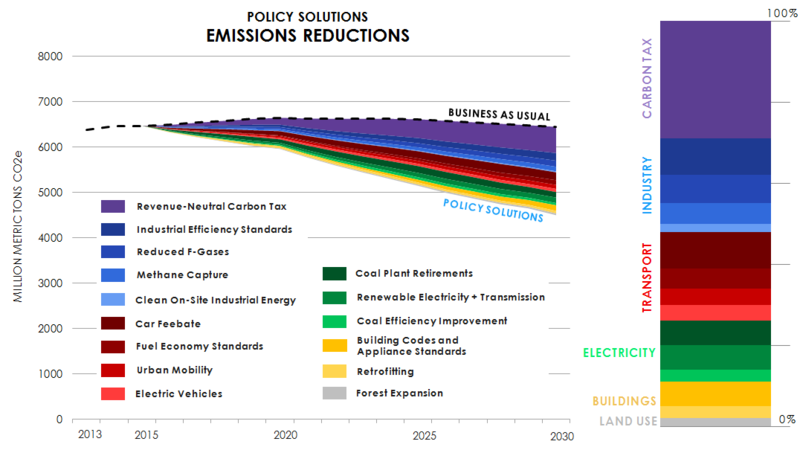 Energy Innovation’s Policy Solutions package finds that the U.S. can meet its 2025 emissions target and save nearly $840 billion, assuming policies begin taking effect in 2016. 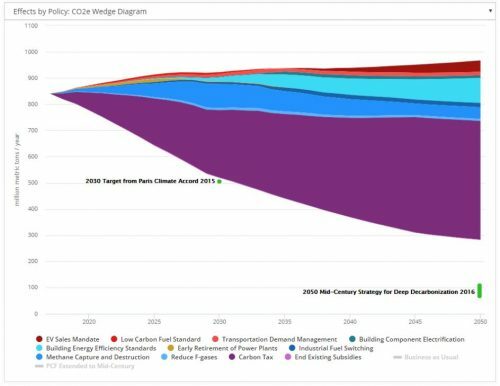 Using the Energy Policy Simulator, we find that if policymakers wait just four years—until 2020—to take action, they risk losing out on nearly $400 billion of savings to meet the United States’ 2025 emissions target. The loss of savings is due in large part to the fact that many policies take time to have their full effect on the economy, as existing vehicle fleets, building stock, and industrial equipment turn over and are replaced by newer, more efficient versions. 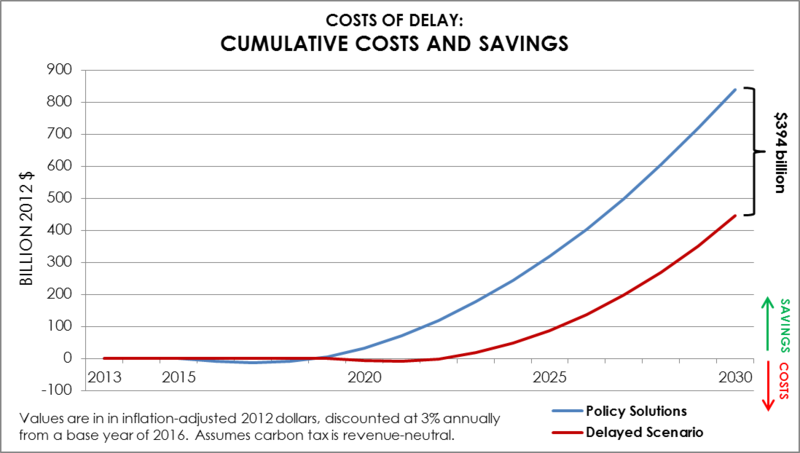 Waiting just a few years to adopt policy delays this capital stock turnover, which means consumers must continue to spend more money to fuel and operate the less efficient equipment. Having four fewer years to meet the emissions target also means that more aggressive action must be taken in order to cut more emissions each year. And it costs more to achieve a faster emissions decline than to use a steady, smooth decline that takes advantage of the natural lifetimes of energy infrastructure. It’s also worth noting that the target is measured in terms of annual emissions, not cumulative emissions. Even though the Delayed package reaches the same annual emissions as the Policy Solutions package in 2030, it achieves less than three quarters of the total abatement of greenhouse gases over the 15 year period.